Monday - Thursday: 5:30 a.m. - 11 p.m.
What train goes to Chelsea Piers? Chelsea Piers is located within Hudson River Park between 17th and 23rd Streets and is easily accessible by the 1, 6, W, N, R, C, E, V, F, and PATH trains. You can catch a crosstown bus from 23rd Street and Sixth Avenue, a five-minute walk from the hotel, straight to Chelsea Piers. 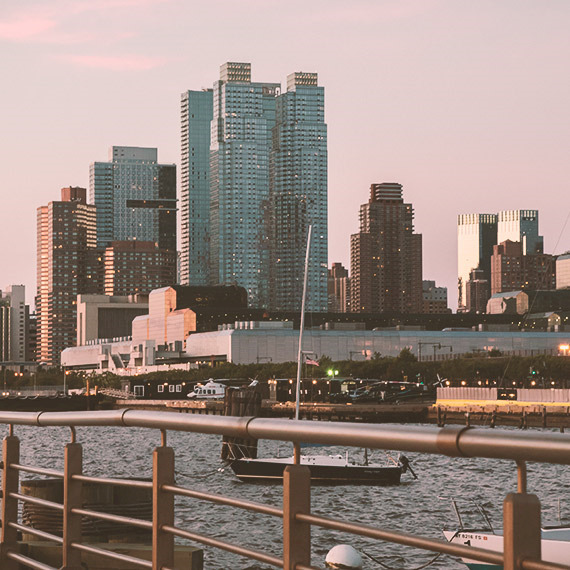 If weather permits, take the 30-minute walk from The Evelyn to Chelsea Piers and enjoy the sights, The High Line, and the food stops along the way. Does Chelsea Piers have parking? Yes, there is on-site parking available at Chelsea Piers 24 hours a day, 7 days a week. Self- parking is first come, first served at Piers 61 & 60, or you may valet park at Pier 59 for $22 for the first hour, $26 up to two hours, $42 up to four hours, and $56 up to six hours. Guests of The Evelyn may valet park at the hotel and opt for subway service for convenience.